There are many Megalodon teeth for sale and collector interest is surging. Knowing if you are getting the best value for your investment can be intimidating as you navigate the waters of what is for sale. Below are some key factors to look for when shopping for Megalodon teeth. The large fossil teeth of the enormous Megalodon shark are nothing short of impressive! The first time you hold a genuine tooth from these ancient monsters will be an awe-inspiring experience you will never forget. The pricing of these teeth can be confusing to understand so before you dive in, it is recommended to read up on what affects their pricing and rarity. Megalodon shark teeth offered for sale are priced based on a number of features that are scrutinized with much more detail than any other fossil. Collectors that are looking for teeth that will appreciate in value and be considered the top of the spectrum, will shy away from teeth that have minor damage or detracting features that to the novice collector, will often go unnoticed. Minor nicks and small missing pieces of a tooth or barely noticeable damage, can have DRAMATIC effect in the pricing, especially when you are talking about teeth in the 5 inch length and up (measured on the diagonal of the longest edge, tip to end of root). The average EBay, fossil show and fossil shop, commonly seen teeth are pretty much priced based on size alone and none will be expensive but they will probably never go up in value nor be desirable to a collector in the resale market. Face it, no creature on the planet ever shed teeth as much as sharks and that includes the Megalodon shark. Average teeth are PLENTIFUL and have no interest to collectors. What are very rare are the "collector grade" teeth that are in a completely different class from the common, cheap teeth. It is the collector grade teeth that HAVE and WILL CONTINUE to appreciate in value over time because they are simply too rare and few. Unlike common Megalodon teeth, the collector-grade, high end teeth have a pricing scheme that is much more elaborate. The following list of pricing factors are singly, not the death of a tooth but should be taken as a whole. If a tooth has a worn tip but is a stunning baby blue and with incredible serrations and 6 inches, the worn tip is not so important. If it is an average color and not unusually large and has a worn tip, then it should not even be considered a collector quality. ENAMEL - The best teeth will have NATURALLY lustrous enamel. Some teeth have a pearly flash or chatoyance in their enamel. When held in strong light, they have a reflective effect deep in the enamel that can cause the shades of the colors to flash light and dark as the tooth is moved in the light. Collector grade Megalodon teeth will NOT have enamel that has been coated, oiled or especially, machine-polished! The teeth you see that are ground and polished are worthless as fossil specimens and should be valued more as trinkets or hand-crafted art items. They possess ZERO value to an advanced collector, will never appreciate as a rare collectible, and their value as a fossil specimen has been destroyed in the process of polishing. Even worse, inlaying anything into the tooth to make it "artistic" is total destruction to the value. Machine polished or inlaid teeth should be AVOIDED AT ALL COST! BOURLETTE - The bourlette is that portion of the tooth between the base of the crown enamel and the root, on the lingual side (the curved side that faced inward to the shark's mouth). It often is a contrasting black band of color that has a natural gloss like the enamel but not as lustrous. In the best grade teeth, whatever the color, it is fully present. On rare occasions, it is a beautiful contrasting color to the enamel and root. The bourlette does not have as much weight in the pricing as does enamel or serrations, but it does play a part. On a tooth of unusual colors and features, not having a bourlette or having only a partially present one will not materially affect the price. On an ordinary-colored tooth, having a thick and complete, lustrous bourlette is a plus. SERRATIONS - The serrations should be crisp and well-defined, lacking any detracting gashes or nicks. Very minor natural feeding wear is sometimes overlooked, especially in teeth that have other exceptional features. Teeth that have stunning and dramatically sharp serrations in perfect order, are extremely rare and desirable! The larger collector teeth (those in excess of 5 inches) will have slightly more feeding damage and wear than collector grade Megalodon teeth in the 3 and 4 inch class. Teeth near or exceeding 6 inches with some MINOR feeding damage, can still be considered valuable, rare and fetch a high price. No tooth REGARDLESS OF SIZE, should have any bite gashes or large detracting nicks, to be considered a top "collector grade" Megalodon tooth. TIP - The tip should be sharp and pointed, ideally, with the single tip serration intact. Again, minor natural wear is acceptable on teeth that have other redeeming traits. Detracting damage, nicks or worn tips are undesirable. A perfect tip is EXTREMELY rare but the tip should not have damage that can be seen with the naked eye, nor have any detracting damage that can be seen with magnification. ROOT - Cracks in the root are not a factor in the value of a tooth unless they are to the point where part of the root is missing. A collector grade tooth will not have any part of the root missing such as missing ends of the lobes or missing parts that have broken off the face of the root on either side. COLOR AND PATTERNS - This is is a huge factor in making a tooth very valuable and expensive. Megalodon teeth found in rivers, usually lack color and are varying shades of gray or black. Teeth with any color and especially unusual color combinations, are EXTREMELY desirable and priced MUCH HIGHER than ordinary colored teeth, given all other traits being equal. Similarly, if a tooth has unusual patterns or banding in the enamel, this too, can dramatically affect the price. It all boils down to the overall aesthetic and beauty of the tooth and how much that one tooth stands out from the everyday boring truckloads of teeth most often seen for sale. Features such as red, gold, pastel or cream colors or patterns such as mottling or spots in the enamel, can push the price many times the cost of an ordinary tooth. This is also true of attractively colored roots that contrast with the enamel colors in the crown. FIND SITE - Where a tooth was found can have some effect on the price or how the other factors are interpreted. For instance, Megalodon teeth from the Bone Valley Formation of Central Florida, USA are typically smaller than average but the colors are unlike anything seen elsewhere in the world. They also have a much higher rate of feeding wear. It is theorized this was an ancient nursery for young Megalodon sharks hence the smaller juvenile size of the teeth and excessive wear. Nevertheless, the teeth are so amazing in their pastel colors and often with pure white roots, that most collectors will accept tip wear and small size, and still pay DEARLY for a tooth from here because of the color. Likewise, taking the site into consideration, a 4 inch tooth from anywhere else is not such a big deal but from Bone Valley, a 4 inch tooth is HUGE. a 5 inch tooth from Bone Valley would be nearly as rare as a 7 inch tooth from any other site, so the find location of the Megalodon tooth can be a factor. Also, rare locations or land sites are also often, more desirable. On the contrary, some locations can be a huge negative. In the United States, fossils from South America are illegal and increasing enforcement efforts by U.S Customs has and could lead to seizure of a single tooth or collection of teeth that are privately held. The most desirable Megalodon teeth are those that come with no stigma of being contraband such as those teeth found in the southeastern United States. MACHINE POLISHED TEETH - Truly high quality Megalodon teeth are bcoming increasingly scarce on the market and because of this, we are seeing an increase in teeth that look impressive but are nearly worthless despite the prices asked. This is especially true in the glut of machine ground and polished Megalodon teeth. You can tell if a tooth has been ground and polished when you look at the enamel on the tooth on the curved side (labial side) and it looks smooth as glass, with a super high-gloss mirror finish. AVOID THESE TEETH - THEY ARE WORTHLESS AS TRUE FOSSIL SPECIMENS and their intrinsic value as such, has been DESTROYED! Buying such teeth should be viewed as purchasing a hand-craft or sculpture. They were polished because the original tooth and its enamel were so badly damaged that they were unsellable and worthless as a fossil in their natural state, and so have been polished to make them "pretty". REPAIR, ALTERATIONS OR RESTORATION - Lastly and most important, AVOID ALL TEETH WITH RESTORATION, ALTERATIONS OR REPAIR if you want a specimen that will appreciate. Unlike all other types of fossils, Megalodon teeth with ANY (even the slightest!) repair or restoration should and will sell FOR A FRACTION of the exact same tooth without such enhancements. Teeth without ANY restoration or repair are WORTH MUCH MORE than the price of teeth with such work performed. More and more, we are seeing Megalodon teeth in the market, having some repair and restoration and this is becoming a big problem with teeth near or over the 5 inch size class. The nature of restoration that is done is of very high quality and can go unnoticed without a trained eye and close examination. Caveat emptor! 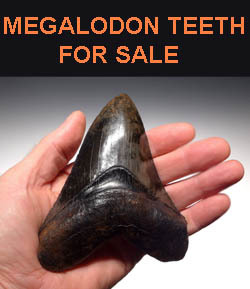 We do NOT sell any Megalodon teeth with repair or restoration. We avoid such teeth and suggest you do the same! Purchase a natural tooth within your budget rather than a large specimen that has been "doctored up". We receive all our teeth in their ORIGINAL condition directly from divers and we clean and conserve the teeth we sell, in our own on-premises lab. This unique protocol of lab-cleaning every tooth we sell, allows us to see first-hand, if a tooth has been repaired or restored and not disclosed. Practically every other fossil dealer or shop that sells Megalodon teeth gets their teeth "finished" and does not operate their own lab, making it impossible for them to ensure any guarantee to their customers of no repair, alterations or restoration. Even if they get their teeth from divers, the teeth are "finished" and they must "trust their source" without the safeguard of doing the preparation work themselves as we do, in their own lab. This is not a personal attack on the competition, just a statement of fact.